Check out this video from our friends at NASA – National Aeronautics and Space Administration! Astronaut Peggy Whitson of Iowa recorded this message from the International Space Station for the Effigy Mounds National Monument Quarter launch last week. Amid miles of quiet farmland draped in snow and fog, the United States Mint and the National Park Service celebrated the Feb. 7 release of the Effigy Mounds quarter—the 36th coin in the America the Beautiful Quarters® Program. 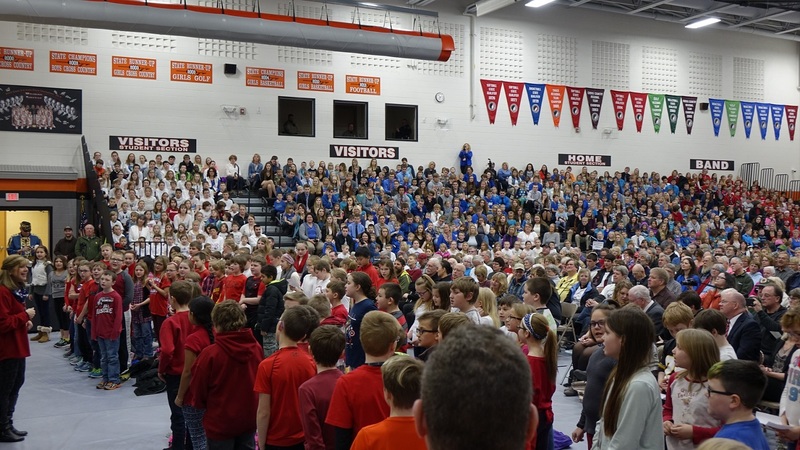 More than 1,700 local residents, including 1,250 students, gathered in the Allamakee Community School District High School gymnasium for the launch ceremony, which was emceed by KWWL News anchor/reporter Jerry Gallagher. Established in 1949, Effigy Mounds National Monument is home to more than 200 mounds in a variety of forms, including more than 30 animal or bird-shaped “effigy” mounds, for which the park is named. The majority of the mounds were constructed between one thousand and two thousand years ago—often to inter the dead, but sometimes for ceremonial purposes, or to tell important stories. To honor this Native American history, the Iron Mound drum group performed a traditional welcome song as the Andrew Blackhawk American Legion Post No. 129 presented the colors. Aptly leading the Pledge of Allegiance was Aida Frey, a junior ranger high school student who earned her first badge from Effigy Mounds. Edmore Green, Tribal Chair of the Sac and Fox of the Missouri in Kansas and Nebraska, spoke to the crowd about the sacred land depicted in the coin’s design and the strength of its indigenous people. The event drew the attention of congressional representatives, even if none could attend due to session. Regional directors from the offices of U.S. Sens. Chuck Grassley and Joni Ernst and a district director from the office of U.S. Rep. Rod Blum read letters from the state’s elected officials, all referencing the important role Native Americans have played in Iowa’s great history. The most unprecedented moment of the event came when the crowd was treated to a special video message from Iowa native Peggy Whitson, a NASA astronaut and American biochemistry researcher currently living on the International Space Station. With inspirational words and a zero-gravity mic drop, Dr. Whitson emphasized that the Effigy Mound builders were inspired to think about things larger than themselves and how the mounds continue to this day to have the same effect on visitors. Effigy Mounds National Monument Superintendent Jim Nepstad also spoke, highlighting the Monument’s cultural association with 20 American Indian tribes, as it protects one of the largest remaining concentrations of ancient American Indian earthworks in the United States. Local fourth grade students performed the Nifty Fifty States song for the crowd, with some former fourth grade students joining in just for fun. Marc Landry also recognized the artist who designed the coin, Richard Masters, a fourth-generation Iowan and member of the U.S. Mint’s Artistic Infusion Program. 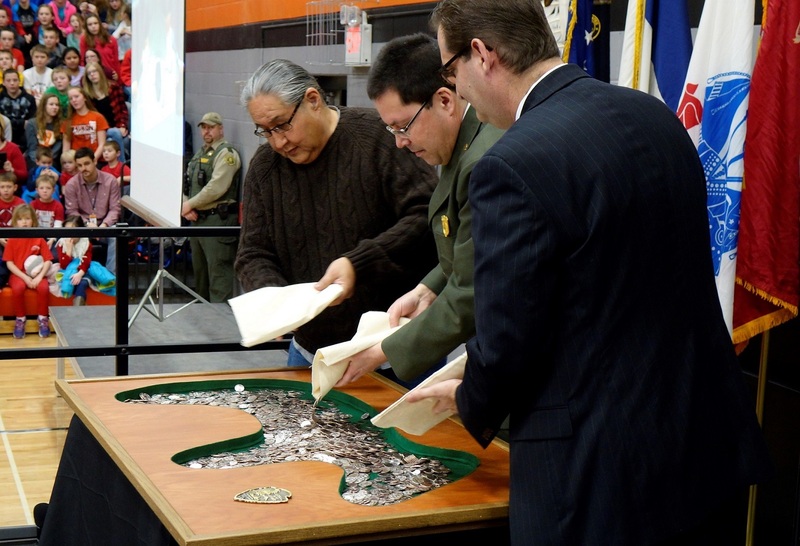 The crowd then got to witness the ceremonial pouring of 2,000 Effigy Mounds quarters into a depiction of the Big Bear Mound. Following the ceremony, the public traded their cash for rolls of newly-minted Effigy Mounds National Monument quarters at the coin exchange hosted by Kerndt Brothers Bank. The bank exchanged $23,000 in (D) quarters in 45 minutes. Next up in the America the Beautiful Quarters® Program line-up will be the Frederick Douglass National Historic Site in Washington, D.C. Keep checking our events page for more information.